Khalil Davenport, 20, and Nasir McNamee, 15, have been arrested and charged with the March 2 murder of Jayvon Mitchell-Pendleton, 20. 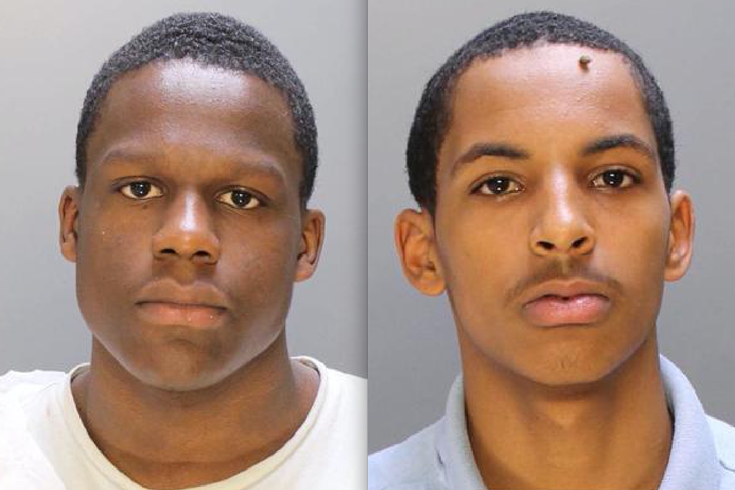 Philadelphia police has arrested two suspects, including a 15-year-old boy, in the shooting death last Wednesday of a 20-year-old man in the city's Strawberry Mansion neighborhood. On Monday, police arrested Nasir McNamee, 15, of the 2600 block of North 23rd Street, and Khalil Davenport, 20, of the 2700 block of North 23rd Street and charged them with murder in the killing of Jayvon Mitchell-Pendleton, 20, of the 2200 block of South Lambert Street. McNamee and Davenport are also charged with attempted murder, criminal conspiracy, aggravated assault, simple assault, recklessly endangering another person, possessing an instrument of crime, violation of the uniform firearms act, and related offenses. According to police, Mitchell-Pendleton was shot several times at about 6:39 p.m. in the 2700 block of North Bonsall Street. Officers, who arrived on scene and found him unresponsive, recovered a .38 caliber revolver from underneath Mitchell-Pendleton's body, police said. Mitchell-Pendleton was taken to Temple University Hospital, where he was pronounced dead at about 8:57 p.m.